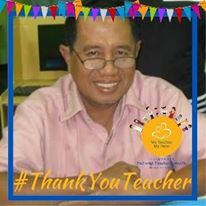 Random Thoughts of Gil Camporazo: Because of you, My Dear Teacher, I Am What I Am Today. Because of you, My Dear Teacher, I Am What I Am Today. Teachers are considered as the unsung heroes. My elementary school teachers from grades one to six have made me of what I am today. The success I have received because of them. I have learned a lot from them. It is still in my conscious mind of what my primary teachers had instilled those characters I had learned from them and they became my strength and my attitude which guided me all of my life. The attitude of being resourceful is what I have developed from my grade one teacher, the late Miss Dolores Acot. I couldn't forget when I read from my report card what she had written. It says, "you work without being told to do so." I treasured that comment and have lived in it. It is a nice feeling of doing things in your own free will, of your own volition for the good of everybody. Thank you, Ma'm Acot. For my grade 2 teacher, the late Mrs. Edda Alano. I remember when she suggested on how to work in the most orderly and easy way. I was one of the sweepers on that day. I was scrubbing the floor heavily, going to and fro. If how big is the wooden floor, it's how hard I scrubbed the floor. She told me to scrub the floor by a small portion by a small portion. I followed her and I wasn't easily getting tired. I found it more fun to do that. So in doing the work, it should be done piece by piece. It's not good to tell a lie. This was the statement that kept on ringing in my ear. My classmates reported to our teacher, the late Miss Aurora Senador of my misdeeds. She called me in our classroom and asked me of what I had done to my male classmate who fell into the knee-deep pond full with water lily. I reasoned out. I didn't admit that I pushed Jose to the pond. She looked at me straight into my eyes and said that I will feel better and could sleep well if I am going, to tell the truth, and accept my misdeed. I replied with tears in my eyes and promised not to do it again. She tapped my right shoulder. How I defended myself from a bully is what I had developed in my grade four. Edwin who kept bullying me inside the classroom. I didn't mind for I was afraid. He's bigger and taller than me. He did it always to me every time we got inside the room. He sat a desk away from me. But he came over to tease me. I couldn't sustain his bullying. I grabbed his pencil which is newly sharpened and stabbed his right arm. The sharpened lead of the pencil stuck to his right arm. He looked pale and he was to cry when our teacher-adviser, the late Mrs. Fortunata Jalandoni (who later became my marriage sponsor) arrived. Our teacher removed the untouched pencil lead from Edwin's arm. She told him not to tease me anymore. Edwin and I became friends. The late Mrs. Editha Gepilano, our grade 5 teacher, was so strict in keeping our notes complete of what she had been teaching. After she explained her lesson, she let us copy her writings on the board. Every Friday, she gathered our notebooks and checked it if it is complete with her lecture. I learned from her the importance of a record-keeping, the value of notes, lecture for further reference later. She was our social studies teachers. My notes were complete of the names of all the cities and their capitals, and so on and so forth. Our grade 6 teacher, Miss Lilia Garin, who died several years ago was our English and Grammar teacher. I had learned from her the rule of subject-verb agreement. She told us that when the subject is singular, the verb ends with "s". When the subject is in the plural form, the verb has no "s". We should always remember that for that is the basic and fundamental rule in writing. That's according to her. And she's right. I always remember her every time I write. She always lets us write a composition on how we spend our Christmas vacation, among others. Those are my elementary school teacher-advisers from 1960 to 1966. Thank you, mesdames. I won't really forget all of you. I owe much of the success of what I have today. Thank you, teachers!